I believe I am not the only person in the world who exhibits a particular behaviour when entering a restaurant for a repeat experience. The vast majority of people evidently do exactly the same. On an earlier visit you have a dish from the menu and it turns out to be a smash hit in flavour town and you gastronomically fall in love. Henceforth for time eternal every time you visit that restaurant you end up ordering that dish again in the hope of capturing that moment of true love, sure you may look through the menu, even hum and ha but in the end you will opt for that hope, again. One such dish for me is served at our local Chinese restaurant, it is their sweetcorn and chicken soup, it is divine, thick, creamy and full of flavour, simply put it is heavenly and thus an inevitable starter no matter whatever else I intend to order. So as I am one of those “foodies” that truly believes that whatever I taste I can make it better myself at home as anything cooked at home has those missing essential ingredients that are rarely if ever found at a restaurant, being passion and love. So you can imagine how I was fired up the other night when flicking through my cookbooks the other night looking for inspiration when I came across a recipe for my favourite soup, to the kitchen! Peel and wash your fresh corn on the cobs and then pat dry with some kitchen roll. Place on a baking tray and drizzle the olive oil over them. Give them a good rub all over to make sure the oil covers them full. Sprinkle some salt over them and pop into the oven for 20 minutes or until looking golden. Remove and allow cooling. Whilst you corn is cooking wash and quarter you chicken and pop into a large pot. Roughly chop your carrots, onion and celery and throw them in the pot. Next our spices, so add the peppercorns, parsley and bay leaves. Finally add enough chicken stock or water to just submerge the contents of your pot and a good pinch of a nice salt crystal. Bring to the boil and then gently simmer for an hour. Turn of the heat and leave to cool for half an hour. With some tongs gently extract the chicken form the pot and place into a bowl to drain a bit, the rest of the contents we need to sieve to remove the veggies and herbs we no longer require. Remove the skin from the chicken and discard (unless you own a hound) and then remove all the meat and shred it into small strips and place back into the draining bowl. With a sharp knife cut the corns from the cobs and place into a bowl. Place the stock that is now free from any bits back into you large pot and bring back to the boil. Add one tin of creamed sweetcorn. Cook for 5 minutes and then add the bowl of chicken and any juices collected and carry on cooking for a couple more minutes. Finally add the bowl of roasted corn you have made earlier and season to taste. Simmer for a couple of minutes and then serve and enjoy the subtle blend of flavours carried over your taste buds by a wonderfully rich chicken stock, bliss. Now western food tastes would dictate that we should have something to go with this soup, now being a Chinese dish it is usually served on its own or as part of a larger meal. Myself I must admit to liking a nice fresh multigrain roll with lashings of butter as a partner or if you wanted to build on the corn theme of the dish some warm butter chunks of American corn bread works amazingly well! It’s like a ‘Merican and Far East Fusion thing, and it’s a marriage. Have you ever found a bizarre fusion of different cultural foods? Mmmm, that looks so good, I do love a soup especially at lunchtime when the children are at school. Love it! Perfect soup for this awful weather 🙂 Shared and pinned! 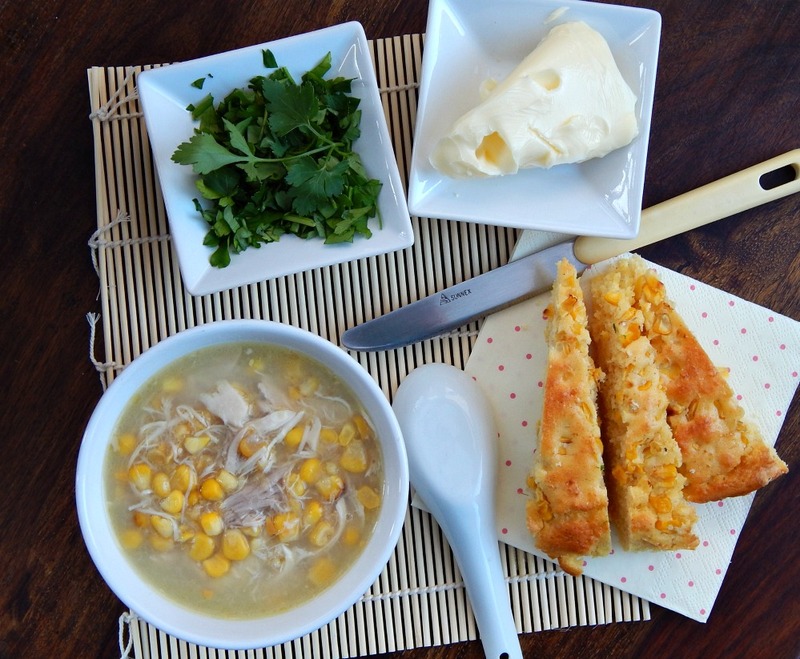 I haven’t tried or heard of chicken sweetcorn soup. I bet my husband would love it. I’ve never heard of this soup before. This looks delicious! I think I would totally give this a try. 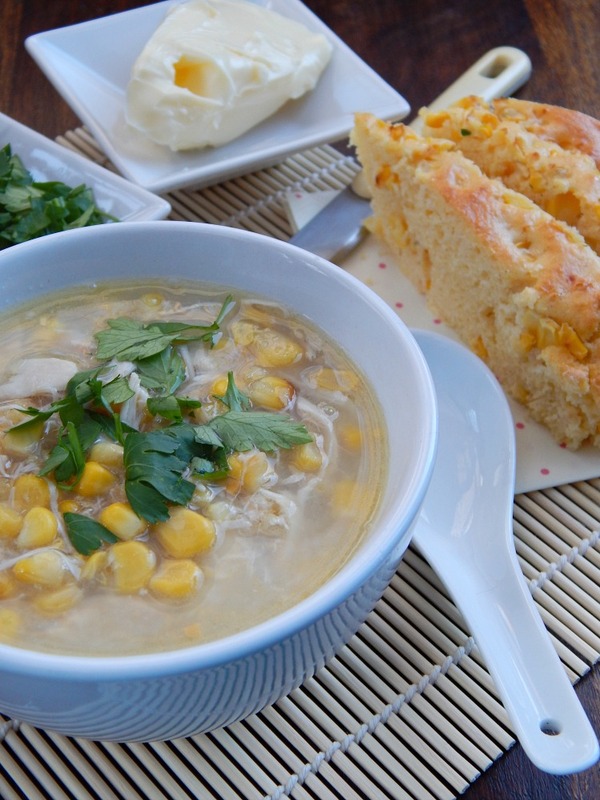 I am a soup person and I also love corn, so this is a hit for me. I have to try and make this, oh and the corn bread looks yummy too! That just looks so delicious and perfect on these stormy and snowy winter days…. I have been on a soup kick lately. I need to add this to my list. 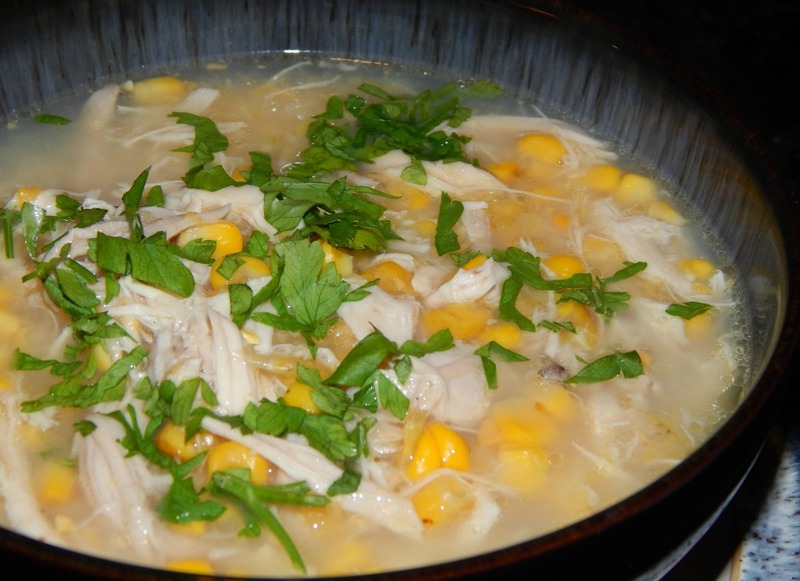 Chicken and corn chowder is one of my favs. I will need to try this version of non-chowder soup. that looks amazing and that cornbread looks delicious too! 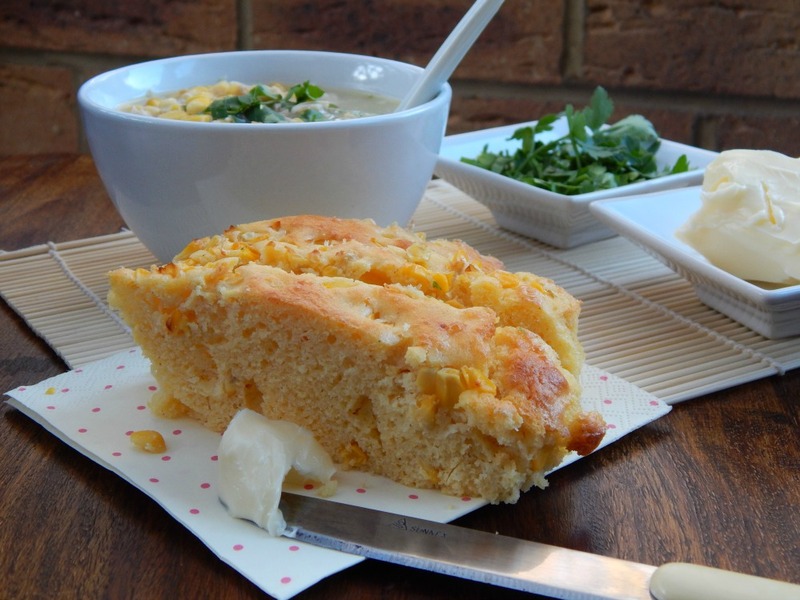 Oh wow, the cornbread really stuck out to me – it looks absolutely delicious! Can I ask where you found the creamed sweetcorn? Our local Tesco has stopped doing it, and I love it served with a crusty bread roll. Hi Emma, My local Waitrose stocks it. Green Giant makes it, so it should be in most supermarkets.